Any type of personal injury accident can be more tragic when it involves children, especially if they suffer catastrophic injuries or death. It can be particularly concerning when the accident occurs at a child’s school where parents entrust their children daily to the care of teachers and other school staff. If your child is injured in an accident caused by the negligence of a school, his injuries could affect him for the rest of his life. As his parent, you can pursue a claim for compensation against the negligent school, but it is very difficult to win a case. Bullying and assaults. Both bullying and fighting are common at school, and a school cannot be held responsible for every conflict. However, a school can be found negligent if it failed to properly supervise students at the time of the incident, knew that the aggressor was a trouble maker and took no action or knew that a fight or other dangerous situation was likely. Slip and fall accidents. Water and debris in bathrooms, slippery floors from cleaning, book bags and other items strewn on classroom floors and food and drink spills in the cafeteria are a few of the causes of slip and fall accidents at schools. Children can suffer broken bones, spinal injuries, traumatic brain injury, and other serious injuries if they injure themselves in a fall. School bus accidents. Negligent bus drivers can cause a tragic bus accident that can result in injuries to students in the bus or when they are pedestrians. Driver negligence, lack of training by the school district or bus maintenance issues are some of the causes of school bus accidents. Many school buses do not have seat belts, which can make the injuries that children suffer even worse. In addition, accidents can happen when children are horsing around on the bus without proper supervision from bus driver staff. Playground accidents. Playground equipment gets a lot of wear and tear due to daily use and the weather. When it is not maintained and replaced when necessary or has a design or manufacturing defect, children can suffer devastating injuries in a fall or other accident while playing. In addition, many accidents are caused by the failure to properly supervise children who do not have the capacity to understand the dangers of the playground or the risks of certain behaviors. Food poisoning. When cafeteria workers do not properly prepare and store food or an outside vendor provides tainted food, children can become seriously ill from food poisoning when they eat breakfast, lunch or other food provided by the school. Sports activities. Some sports, particularly football, include inherent risks of injury, and students who voluntarily engage in the activity may not be able to sue the school for their injuries. 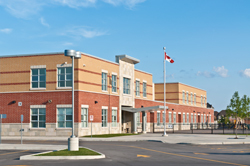 However, when equipment is defective, basic safety measures are not followed or the school staff doesn’t provide proper supervision, an injured student may have a claim for compensation against the school. Outside of school bus accidents, it is very difficult to have a winning case against a school, school staff or the school district. Often the best course is to make sure you have health insurance for the student that can cover the cost of medical treatment in case of an accident. School accident claims are very complicated due to the multiple parties who could face liability and the challenges of proving the school’s negligence. In addition, when the school is a public school, you may have to follow special laws that govern suing governmental agencies. You need the assistance of an experienced personal injury attorney to obtain the compensation that your child deserves and may need for the rest of his life. At Parker Law Firm, we have over 40 years of combined experience helping our clients who have suffered injuries in personal injury accidents. We will thoroughly investigate your child’s accident, build the strongest case possible and fight to obtain the compensation he is entitled to. We are not afraid to take a case to trial when this is in our client’s best interests. To learn more about how we can assist you, call our office to schedule a Complimentary Strategy Session with one of our experienced personal injury attorneys.